Happy Monday! I’m actually off this entire week. Started a new job and they gave us the entire week of Thanksgiving off, could it get any better? So today I’m packing for a bit of rest and relaxation with my family for Thanksgiving week and I’m still working on the Gift Guide. I’m hoping that will be up by next Monday, when cyber Monday is in full swing. I have to admit, I’ve got so much stuff with this guide I’m a bit overwhelmed, so last night I took a step back, sketched it all out and I think I’m focused again. But on to today’s accessory! Today I thought I’d talk to you about another piece I received from Shop Suey Boutique to review and it’s a bag that I’ve been asked about by a few readers. 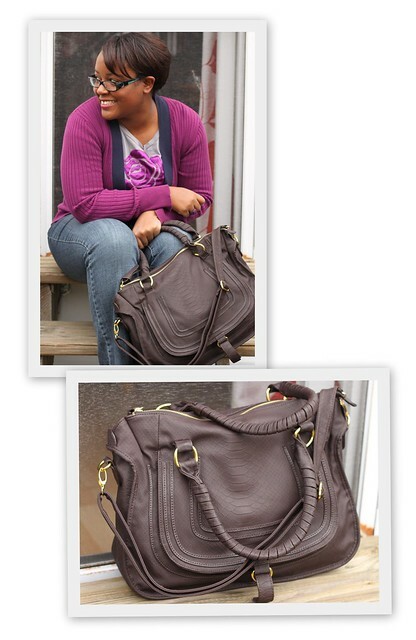 The Rachel Satchel! Update: I previously wrote the Ratchel-Marie but the bag is the Rachel! I updated the link! Sorry! It has the same texture as the Celest but it’s not as big, which actually makes this a nice shoulder bag for everyday. I love the front flap, it opens up to another zippered pocket that I like to slip my cell phone and keys in so they don’t get lost at the bottom of my bag. It also has a zipper pocket on the back and dividers inside the bag. I love the rich chocolately brown color too, it makes it kind of perfect for everything in my closet. It will actually be making the trip down to SC with me because it’s so roomy and I can toss it on my shoulder, plus I love that it has a detachable strap to make it longer! Don’t forget that with the code ART20 you get an extra 20% off of regular priced items (which are already pretty low) but in addition to that, Shop Suey Boutique is celebrating Black Friday and Cyber Monday all weekend long! Shop online at ShopSueyBoutique.com between November 25 and November 30 and receive one of four beautiful necklaces FREE with every purchase! who doesn't like free jewelry? The color wil be selected for you but don’t worry – all of them are gorgeous! You’ll also enjoy FREE shipping on orders over $75! Shop on Cyber Monday (Nov 29) for an extra special selection of markdowns on BRAND NEW items! (These specials are limited quantities and when they are gone, they are gone!). And don’t forget to follow Shop Suey Boutique on Twitter! Sounds like a pretty great deal to me! I’ll also try to put up some Cyber Monday sales and discounts here as well for other great shopping. And I’ll post periodically throughout the week. If you really miss me, you can always find me on Twitter too. Now go on and have a happy Monday! That bag is all kinds of fabulous! And the color is neutral enough that it can go with everything. Love it! So weird though…it it just me or does that back look COMPLETELY different on their site?? Your bag has two handles on the side and that textured “leather”…the pic on their link has only one handle, no rings on the sides for the long strap, and the leather looks pretty smooth and untextured…is that the same bag?? I’d definitely be hesitant to order it as I’m not sure what I’d get! .-= Ariana´s last blog ..Murphys Law =-. Ariana, I had the wrong link! You were so right. Sorry about that. I updated the post. Good eye! OMG I love this bag!!! Might have to add it to my Christmas wish list! .-= Mel´s last blog ..Being productive =-. That handbag is to die for…. Gorgeous! .-= Mustard Seed Collective´s last blog ..Jamie Knows How to Design a Space! =-. I know this post is old but I just ordered this bag in camel and I was afraid it would look cheap but your picture has me excited now! This bag is kind of awesome. I really want to get the taupe one but it only has 1 handle and the one in your picture has 2! Is it soft? Looks like it might be from the pic. I’m always a bit hesitant to order things online!